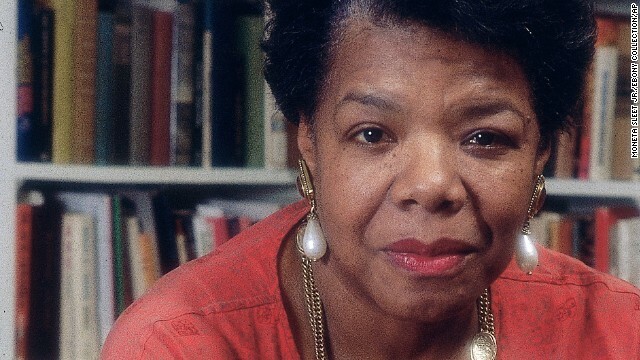 (CNN) -- A literary voice revered globally for her poetic command and her commitment to civil rights has fallen silent. The 86-year-old was a novelist, actress, professor, singer, dancer and activist. In 2010, President Barack Obama named her the recipient of the Medal of Freedom, the country's highest civilian honor. One of Angelou's most praised books was "I Know Why the Caged Bird Sings." The memoir bore witness to the brutality of a Jim Crow South, portraying racism in stark language. Readers learned of the life of Marguerite Ann Johnson (Angelou's birth name) up to the age of 16: how she was abandoned by her parents and raped by her mother's boyfriend. She was homeless and became a teen mother. In her poem "Caged Bird," Angelou wrote: "A free bird leaps/on the back of the wind/and floats downstream/till the current ends/and dips his wing/in the orange sun rays/and dares to claim the sky. But a bird that stalks/down his narrow cage/can seldom see through/his bars of rage/his wings are clipped/and his feet are tied/so he opens his throat to sing." Angelou's list of friends is as impressive as her illustrious career. Talk show queen Oprah Winfrey referred to her as "sister friend." She counted Rosa Parks, Malcolm X and Martin Luther King Jr., with whom she worked during the civil rights movement, among her friends. King was assassinated on her birthday. Obama remembered Angelou on Wednesday, saying she was "one of the brightest lights of our time -- a brilliant writer, a fierce friend, and a truly phenomenal woman." He noted that she expressed her talents in many ways, but "above all, she was a storyteller" and "her greatest stories were true." In CNN's 2009 interview, Angelou spoke in the way that she came to be famous for, each sentence a crescendo of emotion, a call to everyone to act and to be better.